If you’ve ever been to the White Mountains in New Hampshire, you know that breathtaking view you get as you wind around the narrow highway and see the looming expanse of Mount Washington’s rocky peak. While the mountain’s height (6,288 feet) sets a record in the Northeast, Mount Washington’s real claim to fame actually has nothing to do with its size. It’s the extreme weather conditions experienced on its summit that set it apart from similar settings. In addition, Mount Washington houses the only mountaintop scientific station, called the Mount Washington Observatory, remaining in continuous operation in the United States. Manned by a staff of dedicated professionals, the private, non-profit institution is distinguished not only for it scientific research and meteorological work, but also for its unique educational programs. The summit of Mount Washington, which is located in Sargent’s Purchase, New Hampshire, lies in the midst of the Mount Washington State Park. This popular destination draws people from all over, many of whom want to hike the variety of well-known trails and a few who even want to experience what it’s like to sleep close to the stars on the mountaintop. The Appalachian Trail also runs across the summit, and it is here that one of the Appalachian Mountain Club’s alpine huts is located. In addition, hikers are drawn to the mountain’s Tuckerman Ravine, which has 45 degree slopes and is known to experience as many as 100 avalanches on an annual basis. While only six hikers have died in these natural occurrences over the past two centuries, the mountain has in fact seen many other hikers’ deaths on its peak. Many of these have resulted because of the extreme and unpredictable weather and inadequate planning for the conditions. It is also important to note that the highest wind gust ever directly measured on Earth (231 miles per hour) was recorded by the Mount Washington Observatory in April of 1934. Such continuing strong, and capricious, weather conditions can make the peak an extremely hazardous place to be during the winter months. If you want to visit the summit firsthand, there are several different tacks you can take. First, if you are a very experienced hiker, you might consider walking up one of the designated trails. Just beware during the winter months, as the weather can make this a very dangerous proposition. In reasonably good conditions, the hiking trails will require a round trip hike of 8 miles. On the other hand, you can find a safer alternative by hiking on the auto road, but this is a much less direct route and doubles the mileage totals. You can also drive up the mountain by car. It takes about 30 to 45 minutes to span the distance each way. But keep in mind that there are special turnoffs along the road where you can stop to admire the scenery, so most people allow a lot more time to make the trip. 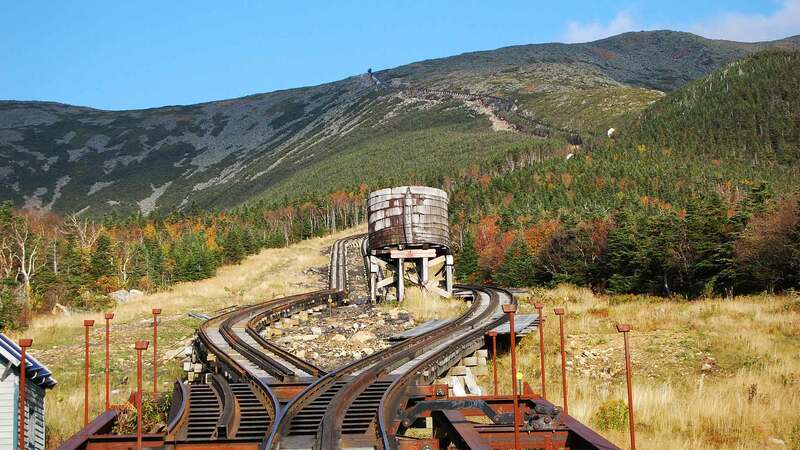 Another popular option is the famous Mount Washington Cog Railway, which was built in the mid 1800s and continues to transport passengers up the mountain today. This scenic ride takes a total of about three hours up and down, including a 20 minute visit on the summit. No matter how you get there, once you reach the top of Mount Washington, in addition to the Mount Washington Observatory located there, you’ll also find a visitors center, a museum and a gift shop. If you are looking for a place to stay overnight, you might consider becoming a member of the observatory. They offer “members only” summer and winter educational trips that include staying on the peaks. Some of the subjects covered during these outings include mountain photography, mountain meteorology and glacial geology of the White Mountains. Each session includes roundtrip transportation to the summit, tours of the observatory’s weather station, classroom presentations, outdoor field trips-weather permitting, meals and snacks, and overnight accommodations. Participants must be in good physical condition and come prepared with a sleeping bag and adequate clothing and seasonal gear. If you don’t want to attend an educational seminar but you do want to stay on the mountaintop, or close by anyway, you can stay at the “Lakes of the Clouds Hut.” Although the hut isn’t actually located on the summit itself, it’s the next best thing from June to September when full-service overnight lodging is available only 1,238-feet from the peak. The hut sleeps 90 people in coed bunkrooms set up to accommodate 6, 8 or 15 people. Breakfast and dinner is also served. If you are drawn by the beauty of Mount Washington and love the outdoors, you may want to think about taking part in the next Mount Washington Road Race. This annual event, which is held each June, draws runners from around the country.